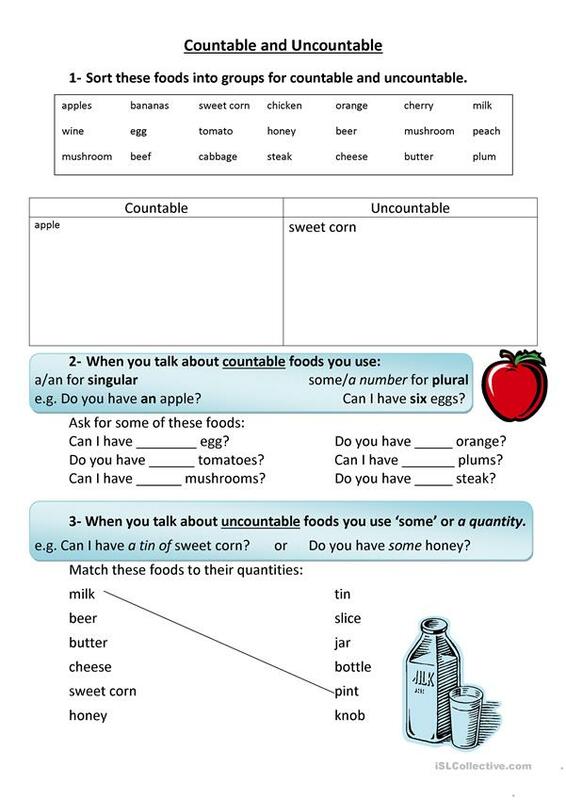 Elementary worksheet introducing countable and uncountable nouns through food. Sort food into the two groups, use grammare to ask questions about food and match food to their common 'quantities'. This downloadable printable was created for elementary school students at Elementary (A1) level. It is aimed at revising Countable and uncountable nouns in English, and was designed for enhancing your groups' Speaking and Reading skills. It is focused on the vocabulary topic of Food. hilaryfbb is from/lives in Italy and has been a member of iSLCollective since 2011-10-28 09:57:52. hilaryfbb last logged in on 2011-10-28 09:57:53, and has shared 1 resources on iSLCollective so far.